We assume you are coming by road... if not, see below. If you're coming by public transport, the nearest railway station is Penrith. You can catch the X4/X5 bus to Keswick from just outside the station; they run every hour. The busses in Keswick stop outside Booths supermarket. 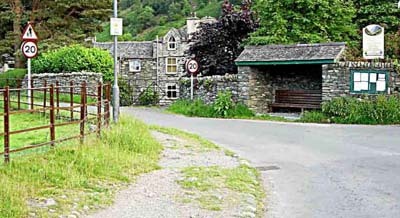 From Keswick the no.78 Borrowdale busses run every 30 minutes in the high season, just ask the driver to stop at Stonethwaite Road End, from where the picture above was taken, showing our front gate.